joy magnetism: "Good fortune come to thee." 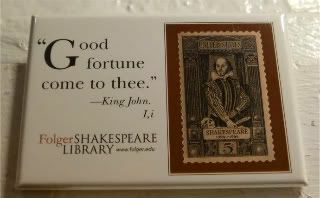 I picked up this magnet in DC at the Folger Shakespeare Library, during their really interesting Henry VIII exhibit last year. It's such a cool place to go, if you're at all interested in the Bard - I admit, I rushed through it, having packed it in with a visit to the Capitol and the Supreme Court. Yes. All three in one day. Anyway, I was going save this magnet for when we see David Tennant and Catherine Tate in Much Ado About Nothing in London in June. It's kinda funny, but when I bought the magnet just before New Year's, I figured I would eventually do an amusing (and probably slightly whiny) post about how the last year's been hard, but maybe soon fortune would smile. But, I'm using it for today, because we're going into 2.5 months into The New Normal and we're still in this ridiculous healthcare holding pattern of let's solicit yet another opinion from yet another doctor, so they can take two weeks to decide what to do, and possibly send him for more tests so that we can figure out more levels and whatnot before they decide what to do. This morning, we're going for yet another follow-up with yet another specialist, so we need all the good fortune karma we can get at this point. Hopefully, we find out what our next steps are in about six hours.